While we might’ve barely made our way into the spring/ summer’13, the fashion world is already abuzz with the forecast of trends that will top the charts this season. FMW gives you a glimpse of the trends spotted among the bedazzling runway models and the chic celebrities and socialites on and off the ramp, at the recently concluded Wills Lifestyle India Fashion Week and Lakme Fashion Week. So we decided to compile the looks and trends that made it to our list of top trends for S/S’13. If you thought neons were only chic the last season, then here’s something that will change your opinion for good! Most designers at the recently held LFW Summer Resort’13 experimented with neon colours and inundated their collection with the fun and punk. 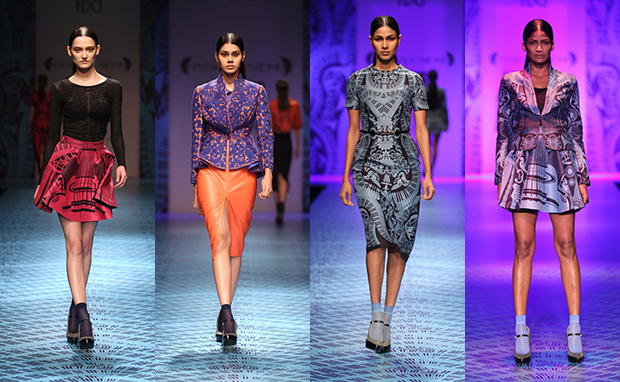 Designer Namrata Joshipura’s collection comprised cute corals and neons, which made for a refreshing change! A few years ago, the designer duo of Gauri and Nainika, presented their collection that was inspired from the 50’s fashion and the highlight of that collection was the peplum. Cut to 2013, a peek at S/S’13 collection and you’d know that peplums have stood the test of time and they’re here to stay. For us, one of the most statuesque, peplums designs came from the much awaited collection of the designer duo Pankaj and Nidhi. Geometric prints and structured waists too, made their way to our top trends list. 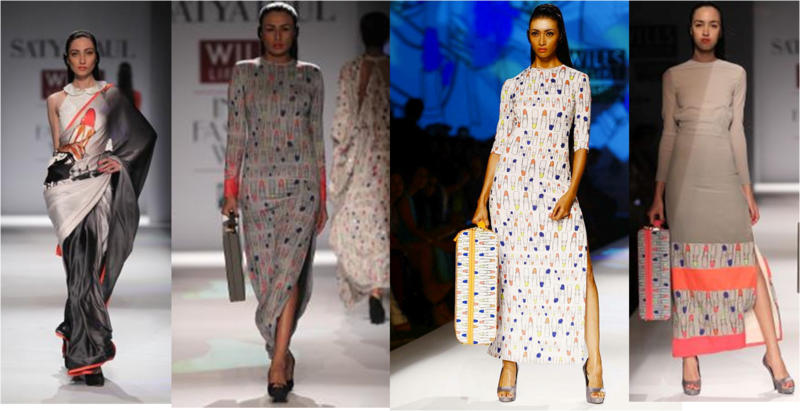 For us, Masaba’s collection for Satya Paul, stood out by all means! Of which the lipstick print pants and tunics were a sure shot hit. Structured waists, was also one of the highlights and were incorporated brilliantly by designer Swapnil Shinde. Now if you’re wondering about the makeup that would complement the trends mentioned above, don’t worry, we’ve got it all covered for you! If the trend at the fashion weeks Summer/ Spring13, is anything to go by, then minimal is going to be a major hit! Most designers chose to go with the plain white face, with minimal use of blush and shadows. If you’re looking to have a sophisticated yet edgy look then coral lips and other shades of pink are your sure shortcuts to looking absolutely gorgeous, this blazing summer!